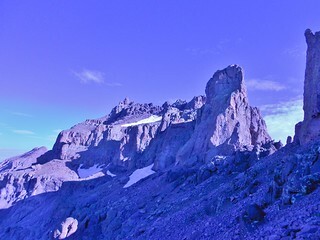 Teakettle Mountain from Coffeepot. The dark gash in the mountain is the Black Gully! Ever since climbing Mt. 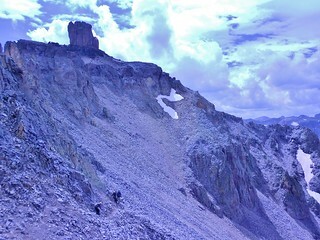 Sneffels, in July of 2013, I had a desire to climb the two centennial 13’ers flanking it. 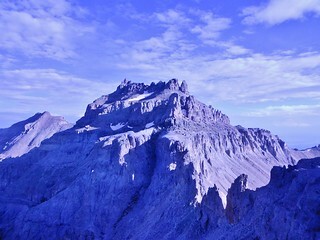 To the west of Sneffels, Dallas Peak stands guard while to the east, there’s Teakettle Mountain. Both captured my imagination and so I must climb them! When I saw Bruce’s trip posted on the CMC website, I called him immediately. 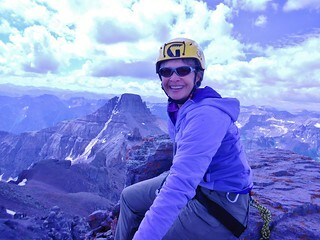 We had a pleasant conversation and we agreed to meet in a climbing gym, prior to the trip. 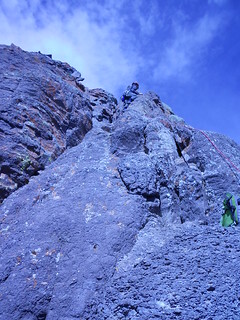 The last section of Teakettle Mountain involves 5th class climbing; so it’s important people understand rope management, basic knots, safety, and climbing. Them gym meet-up went well, so the trip was on! Going up and down Teakettle Mountain was such a steep slog. The only way you could convince me to do it again, would be to do it in Spring. 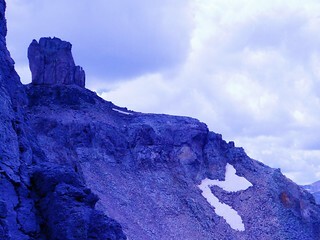 As a snow climb, it would probably be really fun. Meredith, shining bright in a sea of grey. 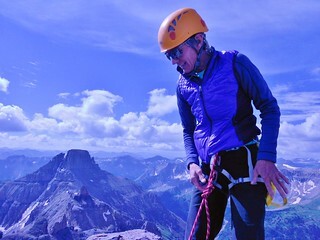 Coffeepot is the block of rock, high above her. 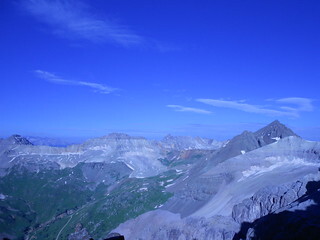 Coffeepot and Potosi Peak. 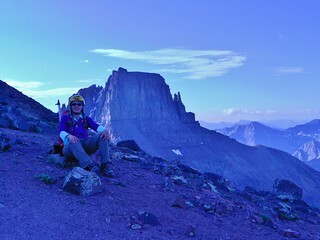 It took us 2.5 hours to reach this spot from the road below…it was a grueling ascent. 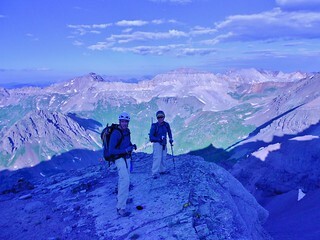 Frank and Tom in the San Juans! The view was incredible. Helen arriving at the base of Coffeepot. She is really photogenic. 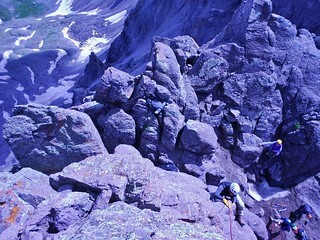 After climbing to the base of Coffeepot, there is a climber’s trail leading northwest towards the black gully. 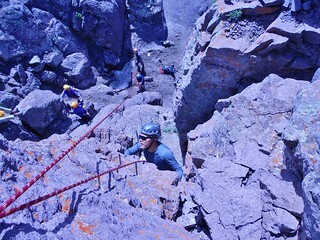 It requires a bit of careful scrambling to traverse over to the black gully. However, by the time one gets here, one should be a pro at treading lightly! 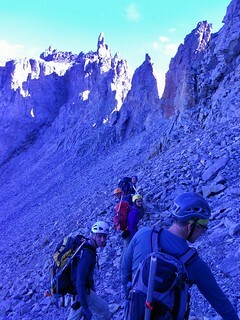 Here we are heading to the black gully. 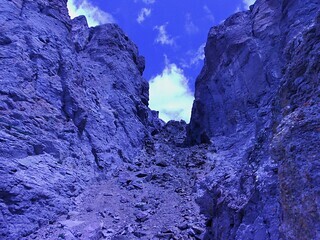 This is the black gully. 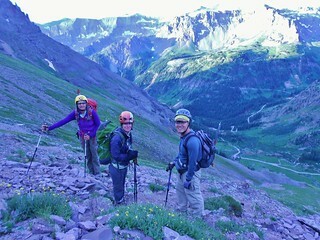 We went up as a group, but when we came down, we went 2 at a time. I saw a rock the size of 3 bowling balls come bouncing down after it was knocked loose by somebody on descent. So, be very careful both going up and coming down! One at the top of the black gully, you can finally see the summit block. It’s the furthest, highest peak from where I’m standing. 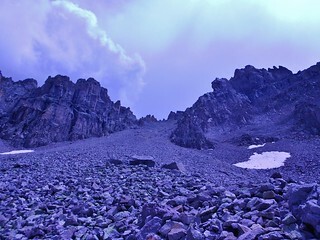 To get there, we traversed below the cliff band, going over the patches of snow, until there was an obvious class 1/2 sandy gully leading upward. 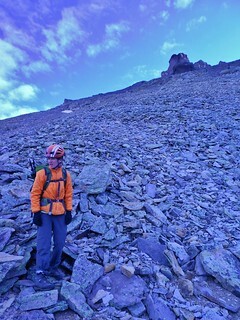 It was very easy to get to the summit block from here. 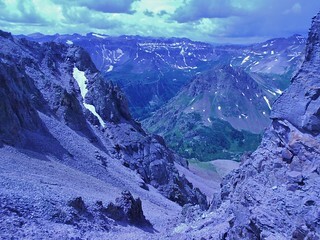 The view of Sneffels, Emma, Dallas, and the Wilson group, from Teakettle Mountain! 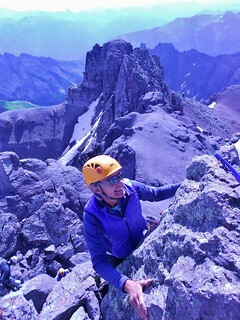 Meredith Stepping up to the Summit of Teakettle. She has one more move from here, and she’ll be on top. She placed 3 pieces of pro. The first one was a small cam, like a yellow alien or metolius? The second one was a 0.75 cam. The third one was a #2 cam. None of the moves were hard, but a slip in the wrong place could be devastating. Meredith getting the anchor ready for a top rope. Since we had 5 more people who wanted to summit, we set up a top rope, just like a gym. That way, people could fly up, take their picture on the summit, and then be lowered down. 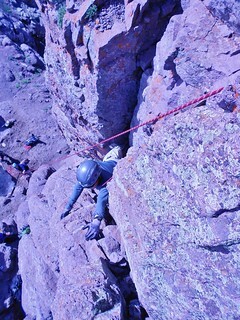 Bruce did almost all of the belaying. Frank at the start of the pitch. 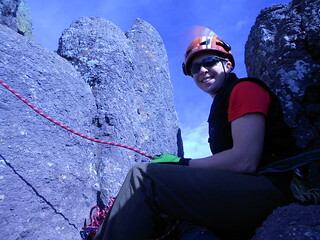 Bruce belaying, while Helen and Lisa encourage. After a few moves on the face, you enter a small alcove. Here is Frank about 4 feet up the alcove. You can climb a crack on the left of the alcove (nobody decided to go this way) or you can go around a pillar to the right of the alcove. Frank exiting the alcove to the right. You can see the crack option, behind him. Here’s Helen making the last move. 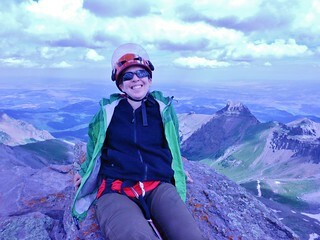 Here’s Helen on the summit. 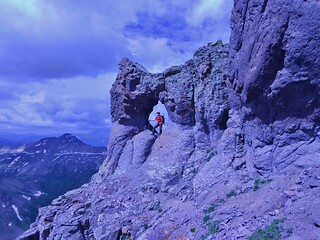 Tom climbing into the alcove. Now you can see why you want a rope…a slip and a fall in the wrong direction would be very bad! 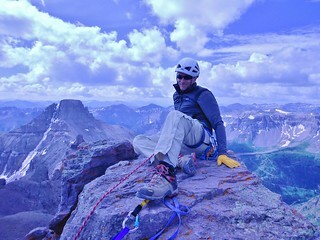 Tom on top of Teakettle Mountain, another totally photogenic person! 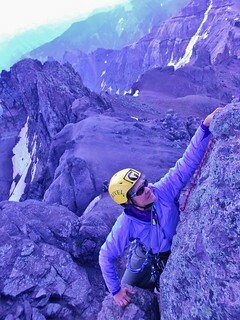 Lisa reaching for the top! 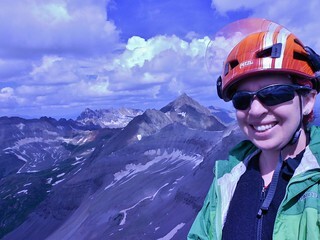 Lisa was thoughtful and took this picture of me on the summit! Thanks! 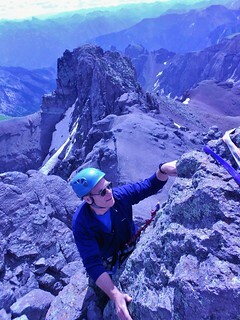 Bruce going for the summit of Teakettle! 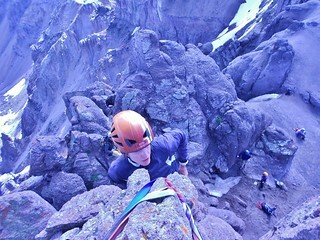 Psyched to see him get the peak. 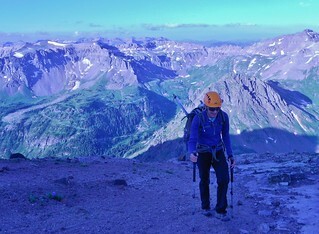 He drove all the way to Ouray twice, on scouting trips, as preparation for our trip. As a result of this hard work and preparation, the trip was excellent. 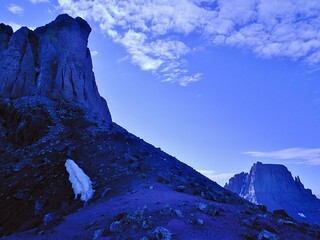 In the handle of Teakettle Mountain. I didn’t have time to do any crazy…I was the last one down off the climb, so I had to rush and get everything put away. I almost forgot to get this picture altogether, but I’m happy I remembered. The handle looks so neat! On the way down, I got this cool shot of Coffeepot. 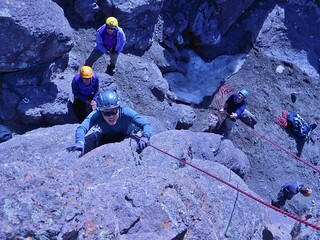 The group scrambling over to our descent. 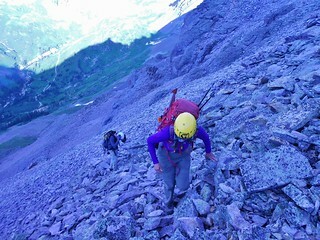 We went directly down the scree. It was awful. 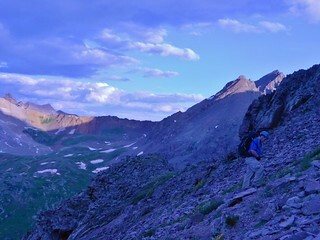 The descent followed the ramp of loose rock. Looking back up at our descent. Did I say this was awful, yet? It might be better with just a couple people, but with 7 people, it was SKETCHY! 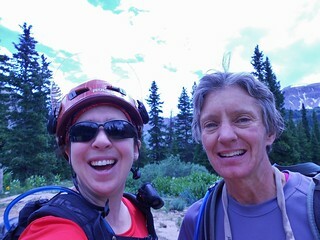 Helen and I, back at the trail head. Meredith and I, a few moments later. I couldn’t muster everybody for a group picture as folks were rapidly de-shoeing, putting away their packs, etc. I think lunch was on the forefront of everybody’s mind. 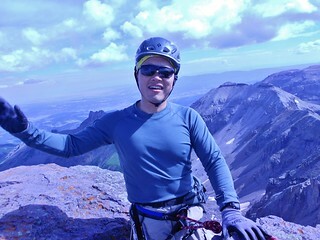 I was really excited that we all made the summit and that we lucked out with the weather. 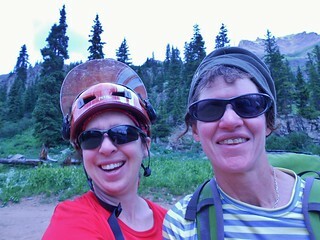 As soon as we pulled into Ouray, it started pouring! 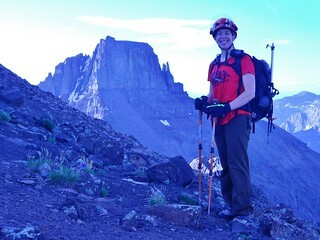 Thank you again to Bruce, and to Lisa for joining Bruce on one of the scouting trips! It was a fabulous trip, definitely one of the highlights of the summer! 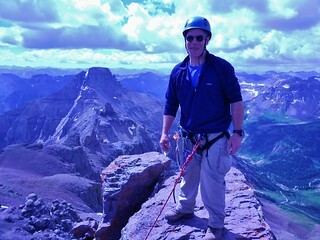 This entry was posted on Thursday, July 24th, 2014 at 1:37 pm and is filed under Mountaineering, Rock Climbing. You can follow any responses to this entry through the RSS 2.0 feed. Both comments and pings are currently closed.